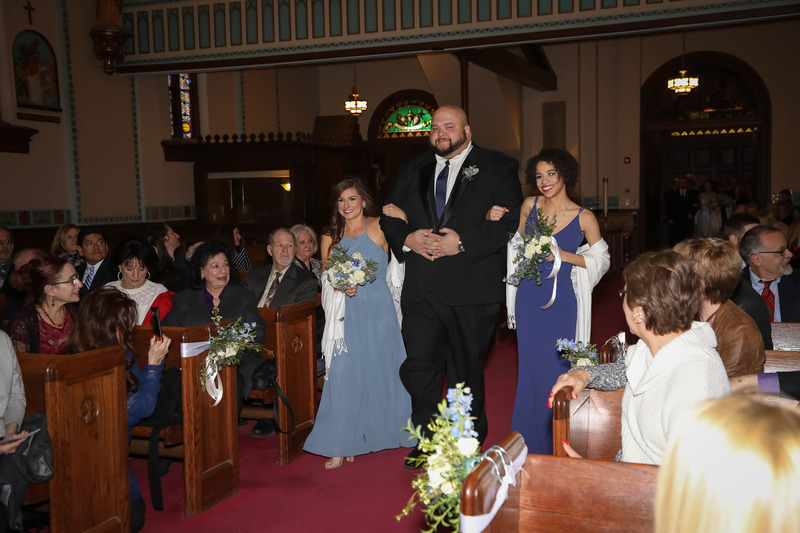 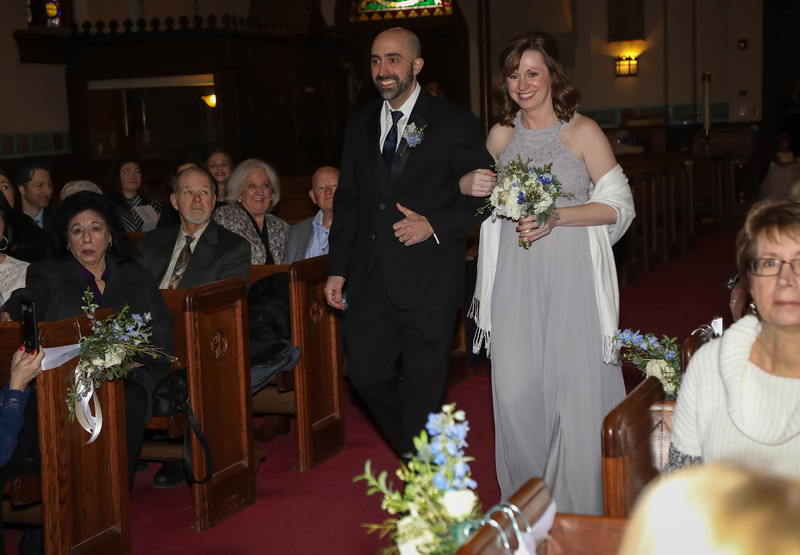 The Dery wedding was nothing but joy! 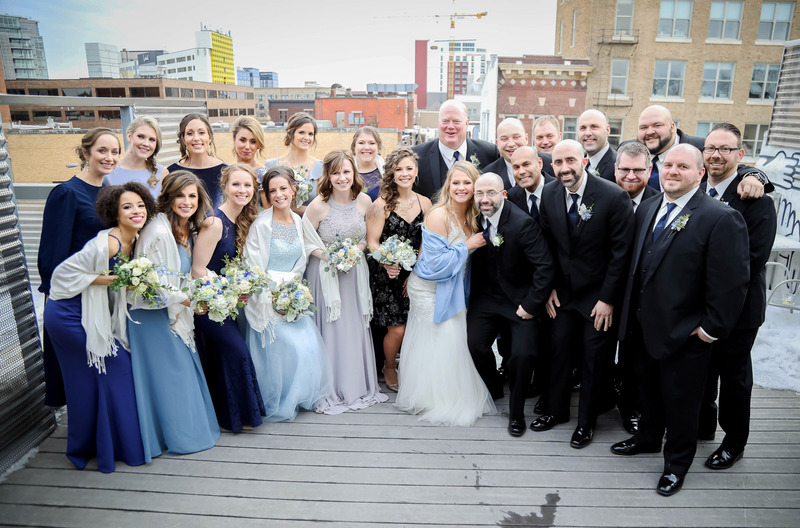 They were such a lively group, which made the day so much fun. 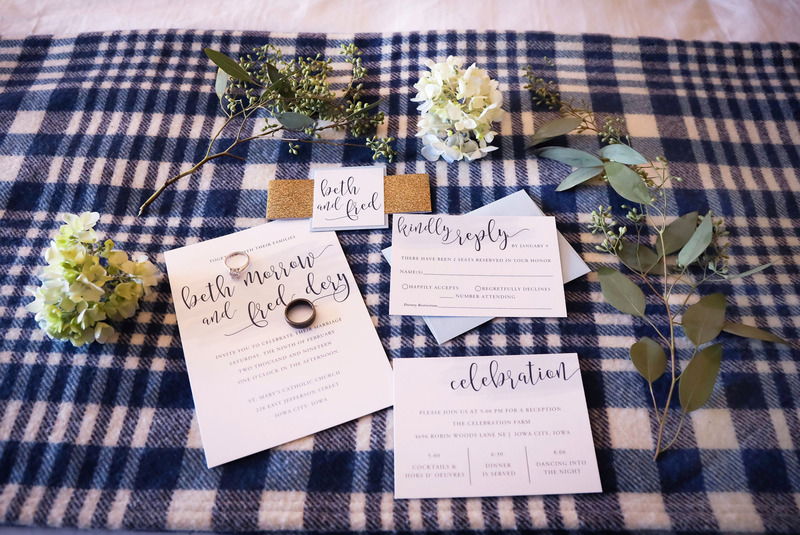 This winter wedding was lush and modern with a lovely palette of blues. 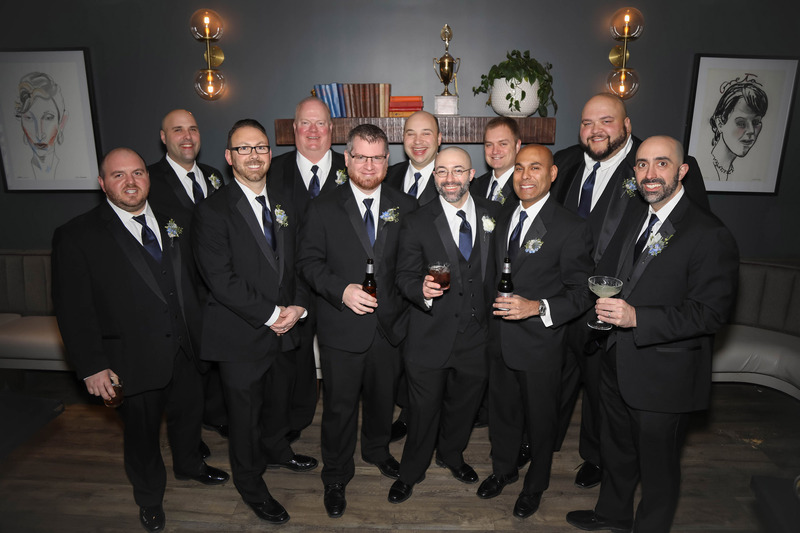 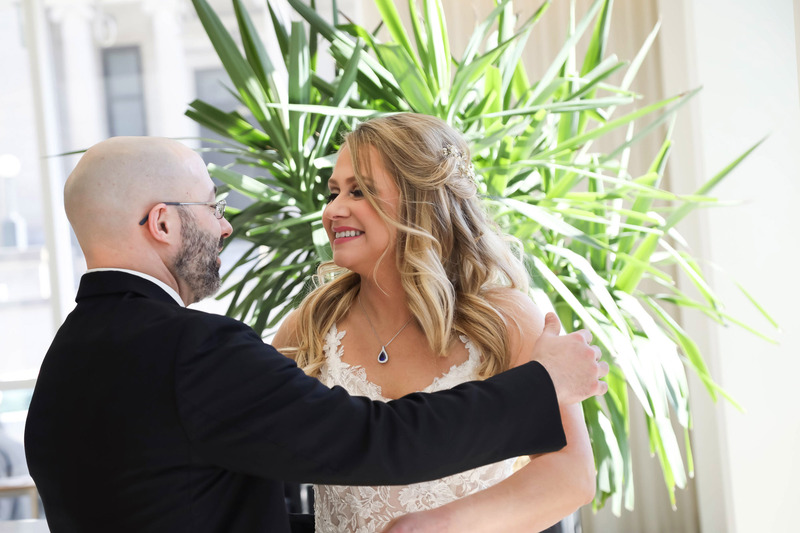 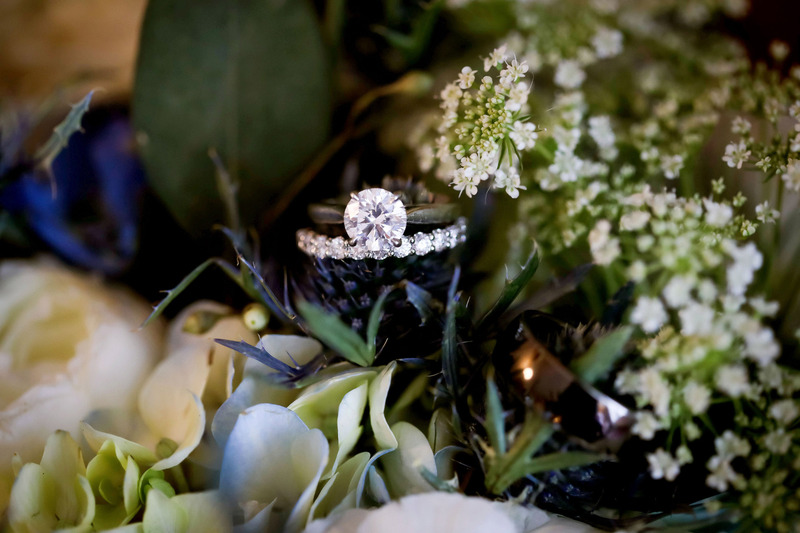 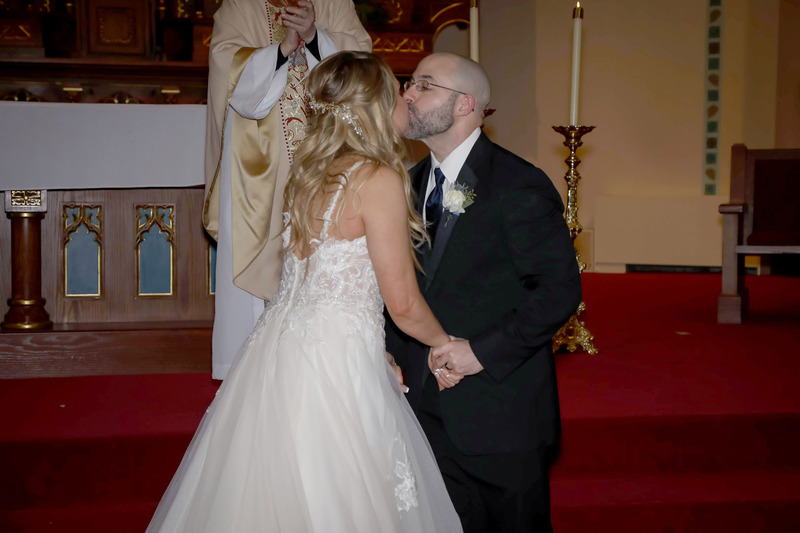 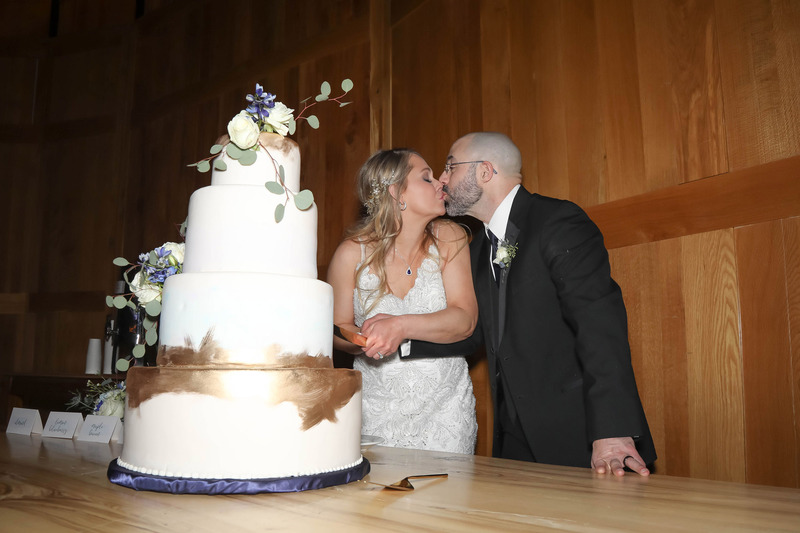 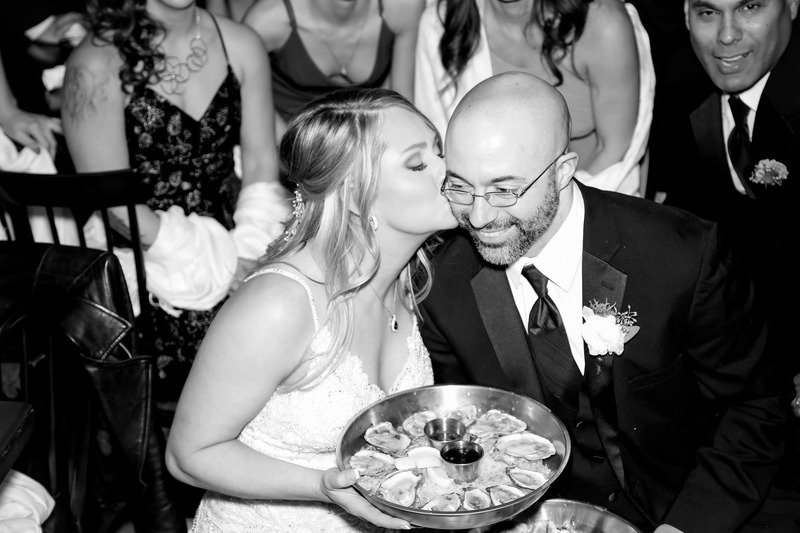 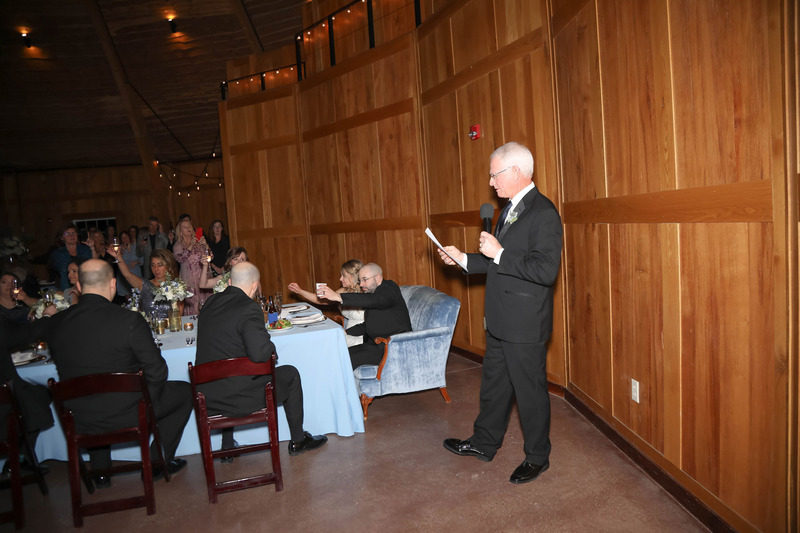 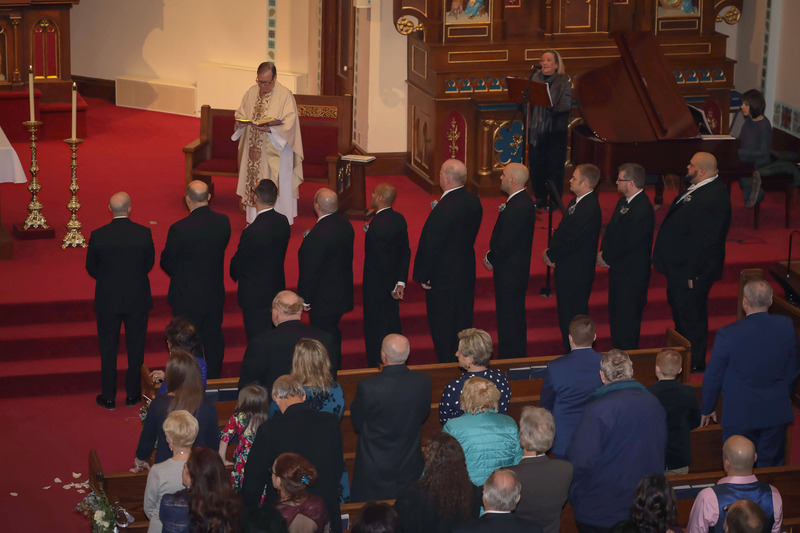 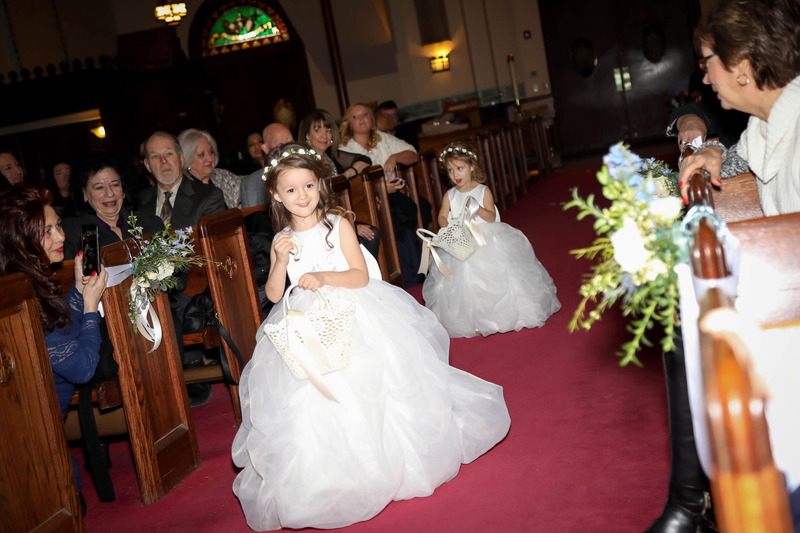 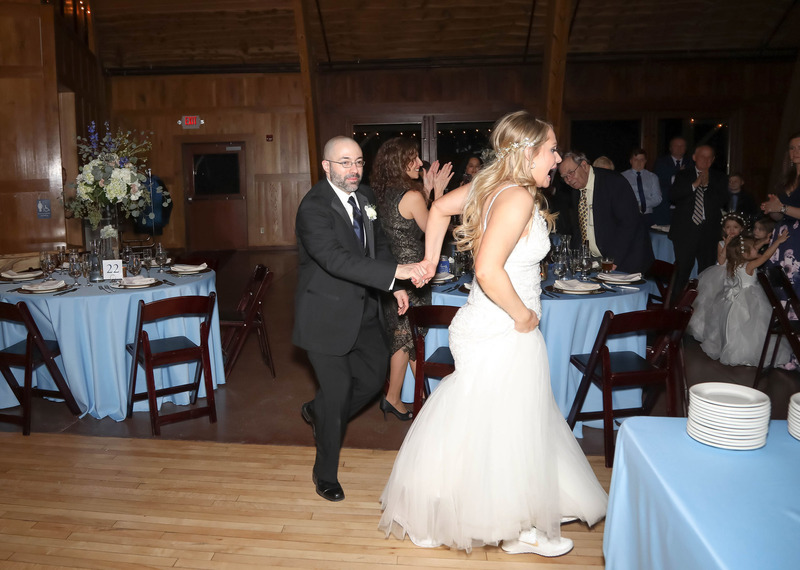 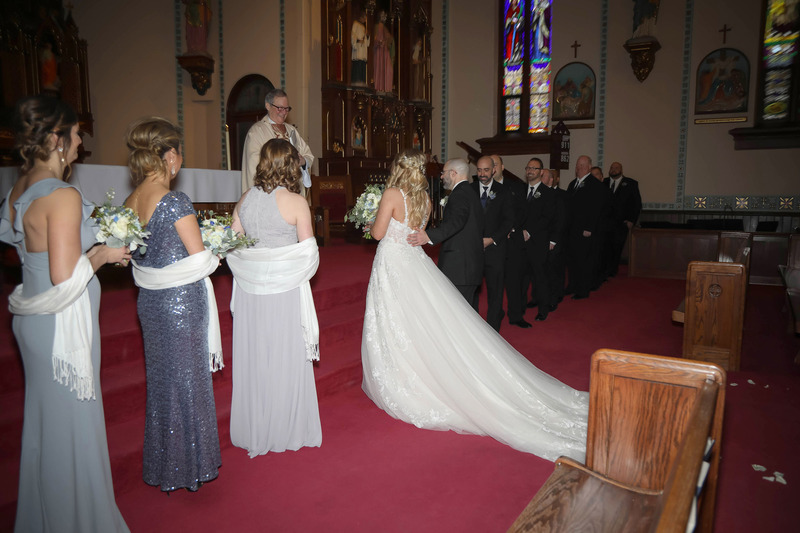 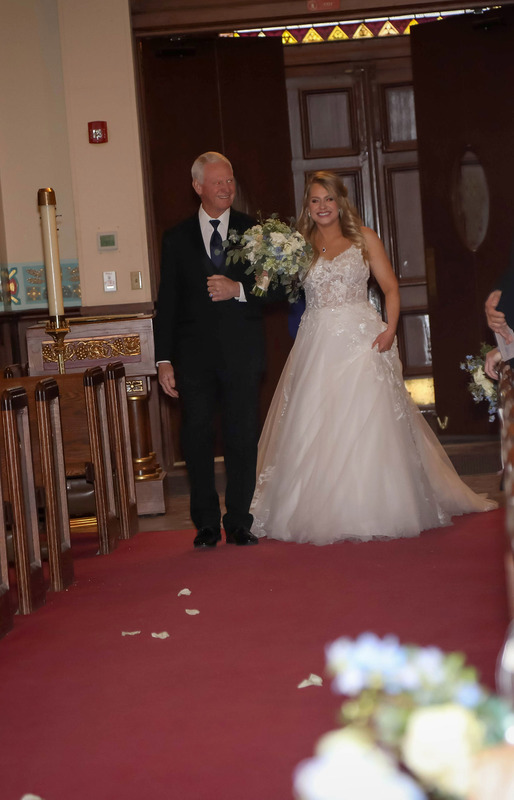 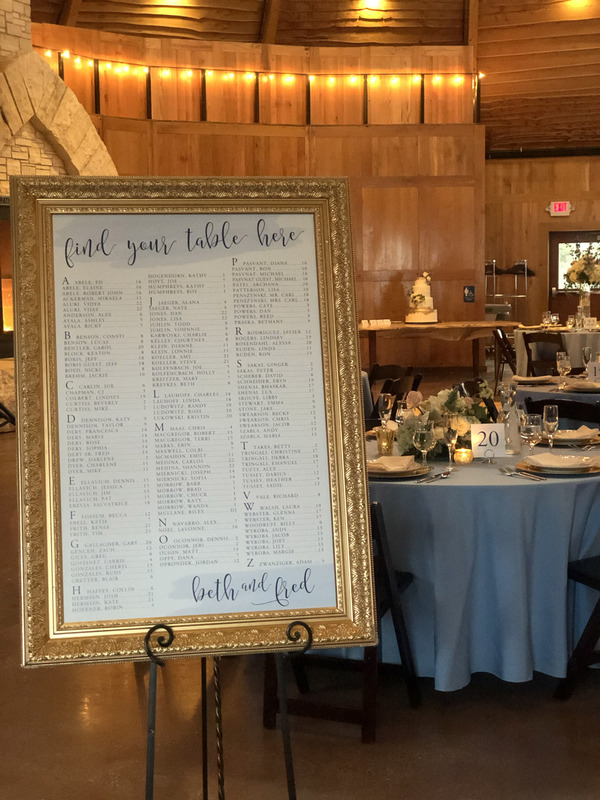 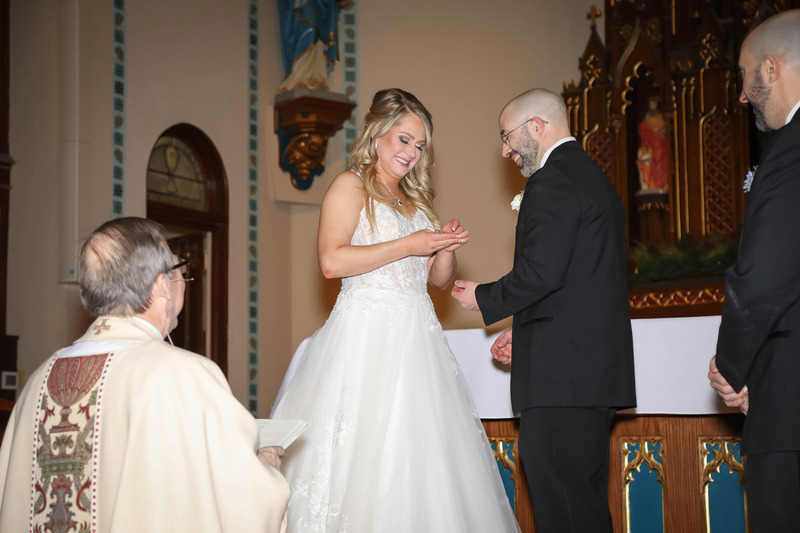 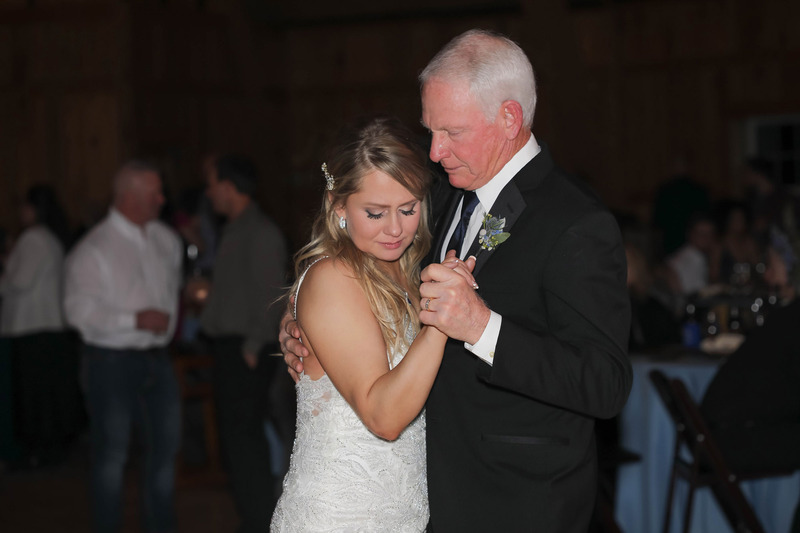 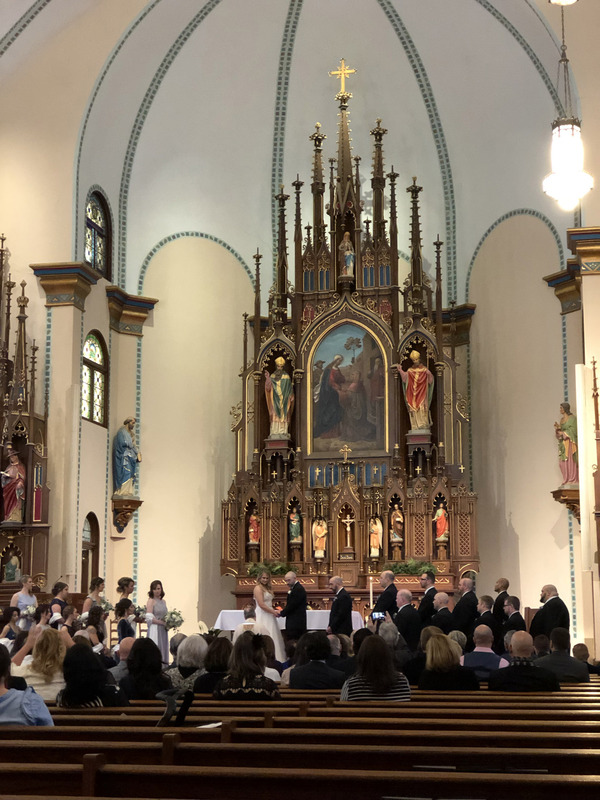 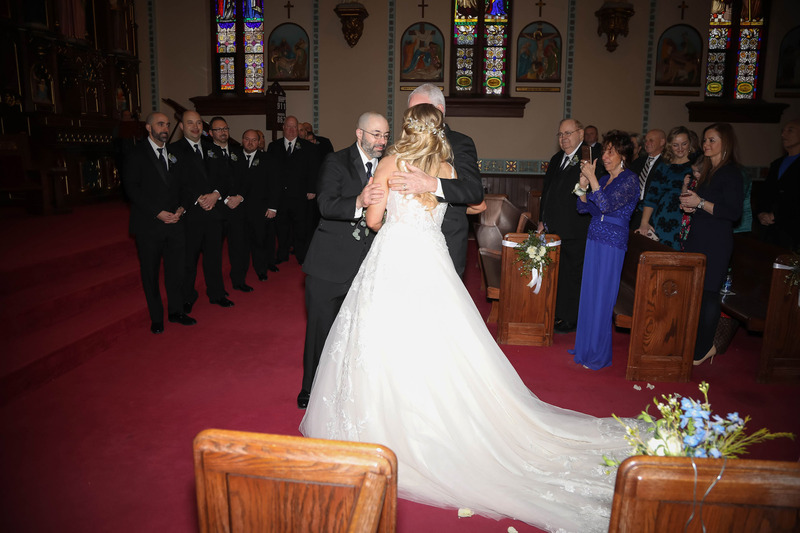 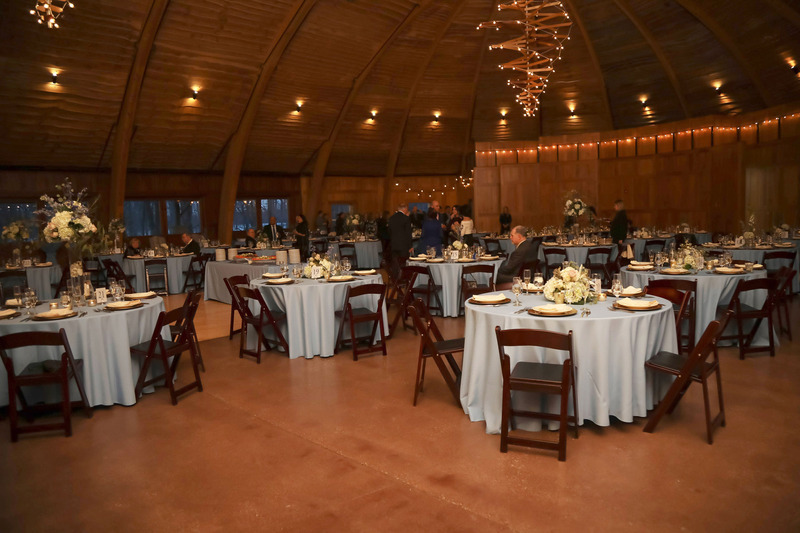 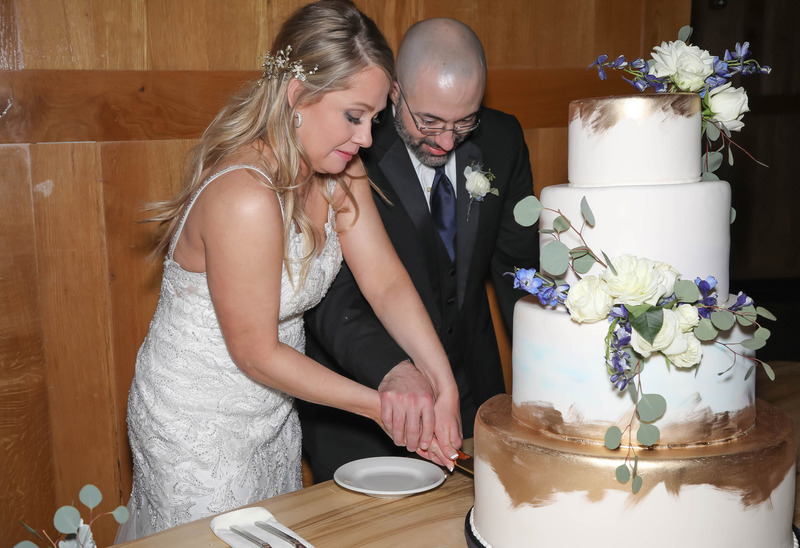 The ceremony took place at St. Mary’s Catholic Church in Iowa City, and the reception at Celebration Farms, which was the perfect compliment to their vision. 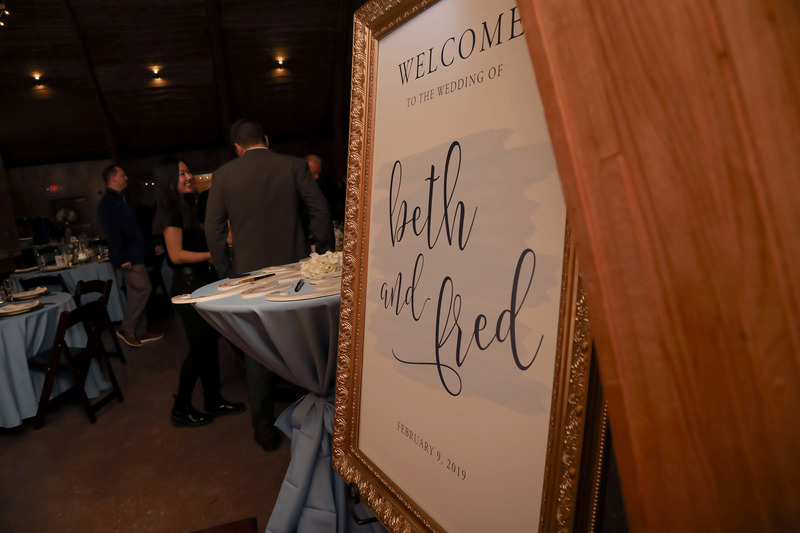 Beth and Fred chose the Experience package from Soirée. 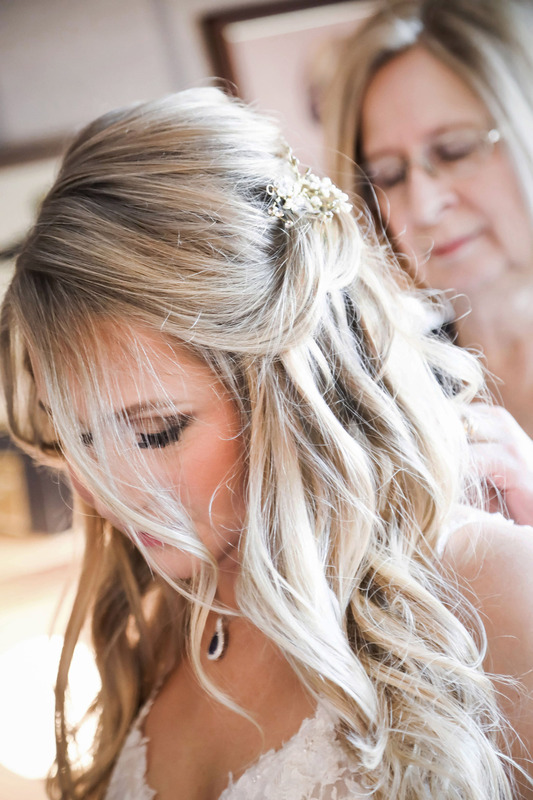 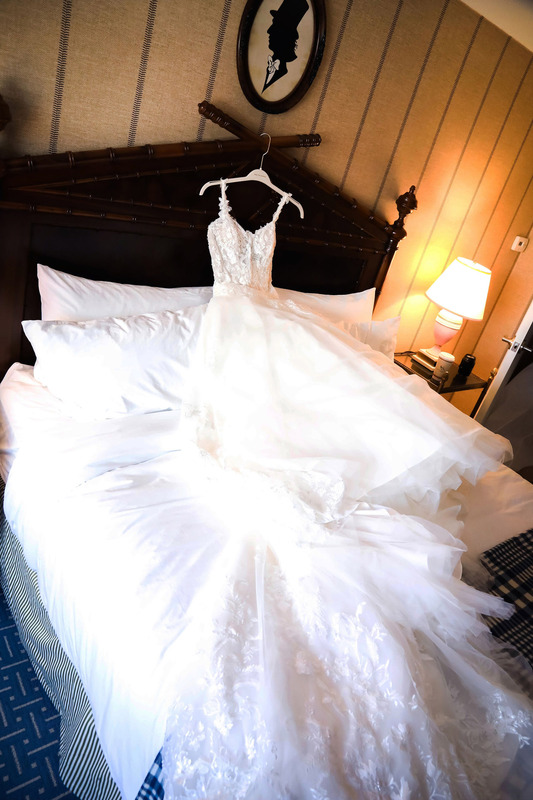 This is our all-inclusive package that gives the couple anything and everything they need to create their dream wedding. 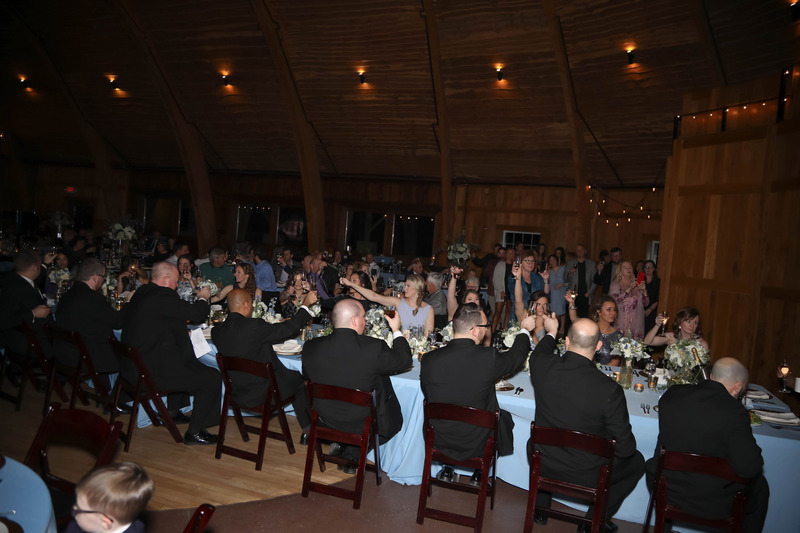 We did exactly this for the Dery wedding. 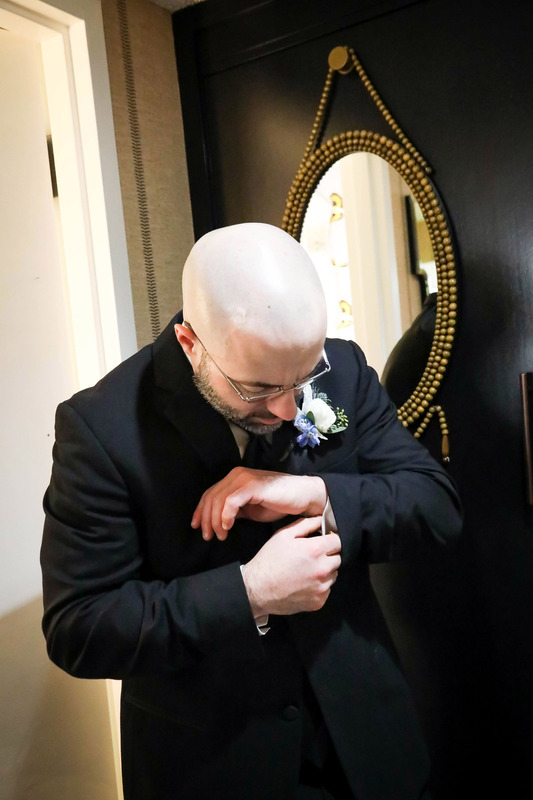 Over many in-person meetings, texts, and phone calls, we were able to hone in on all the details. 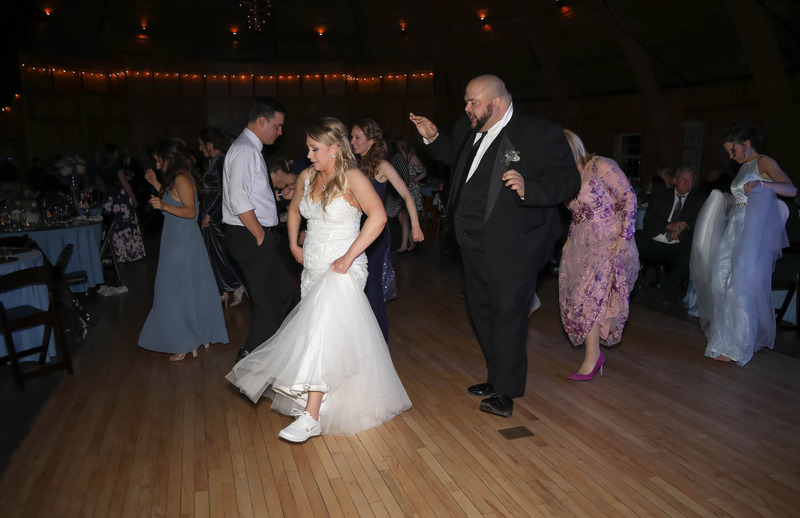 Emily is the best when it comes to the specifics! 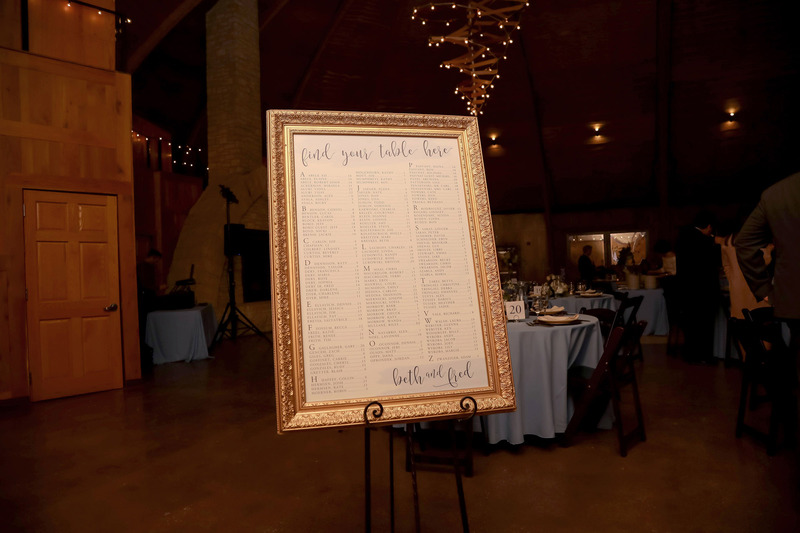 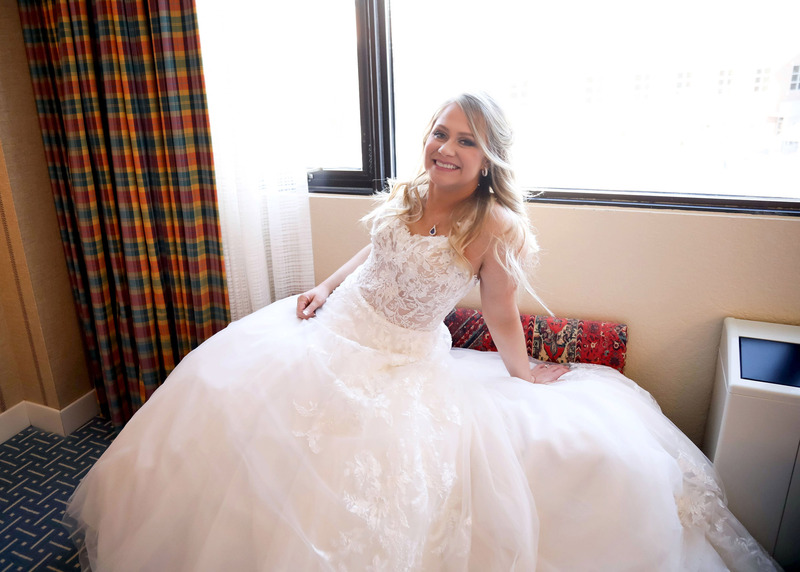 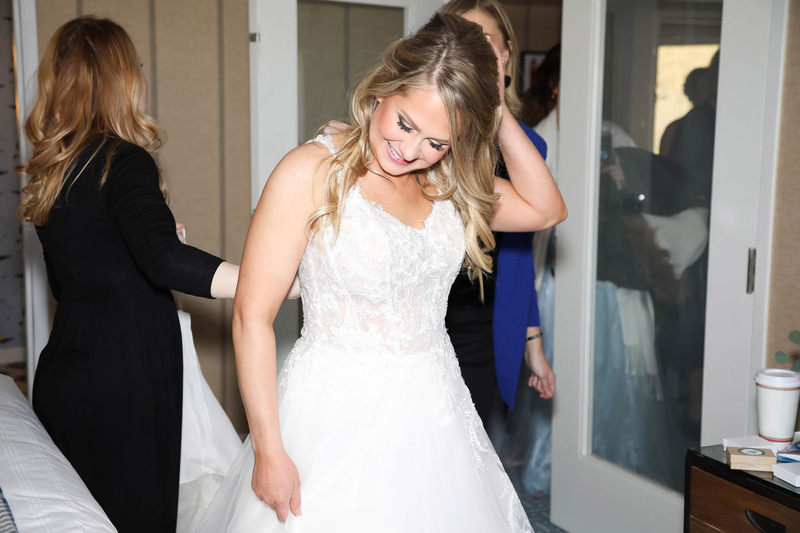 Her customized checklist kept the couple organized and on track for the big day. 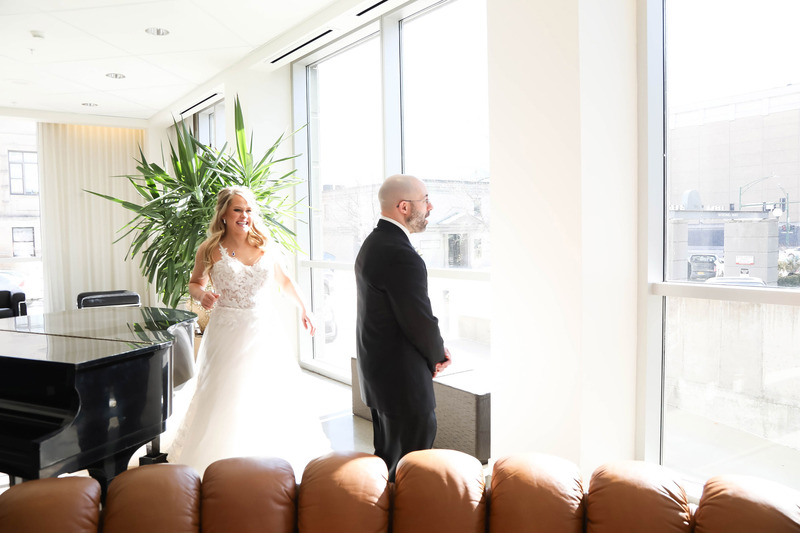 When the wedding day finally came, it was such a breeze! 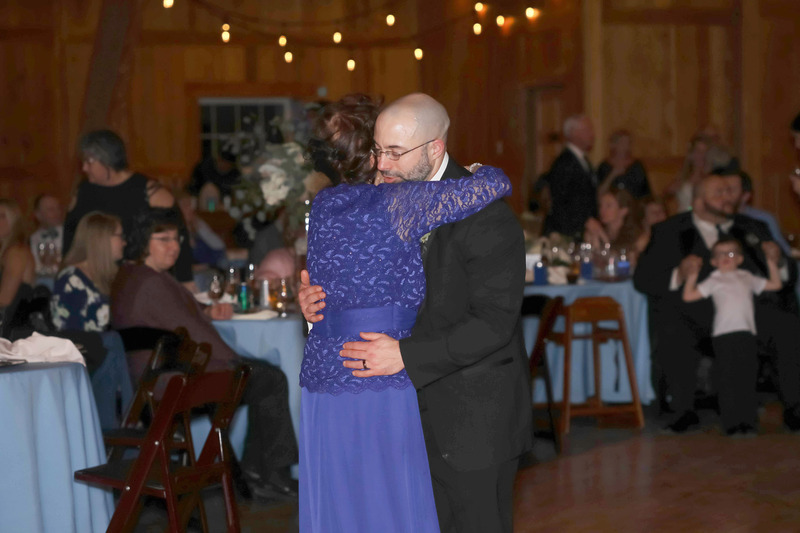 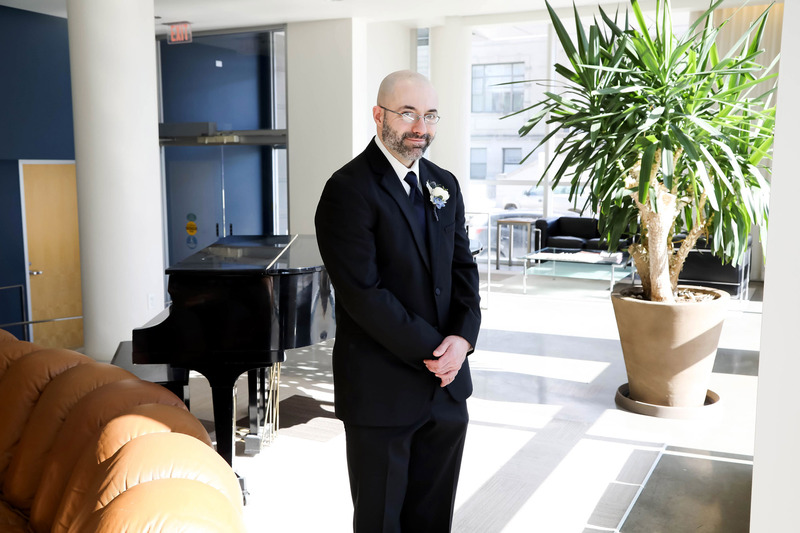 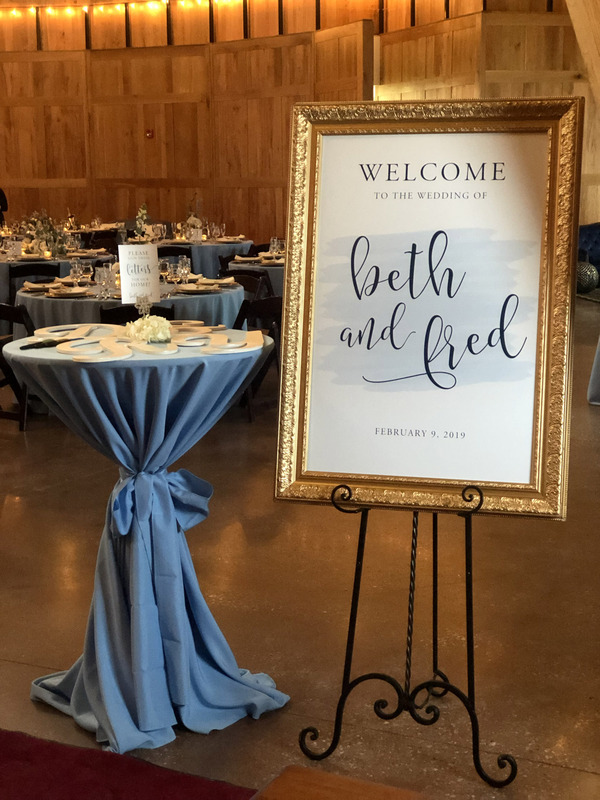 The colors for this wedding were navy, pale blue, light gray, and gold. 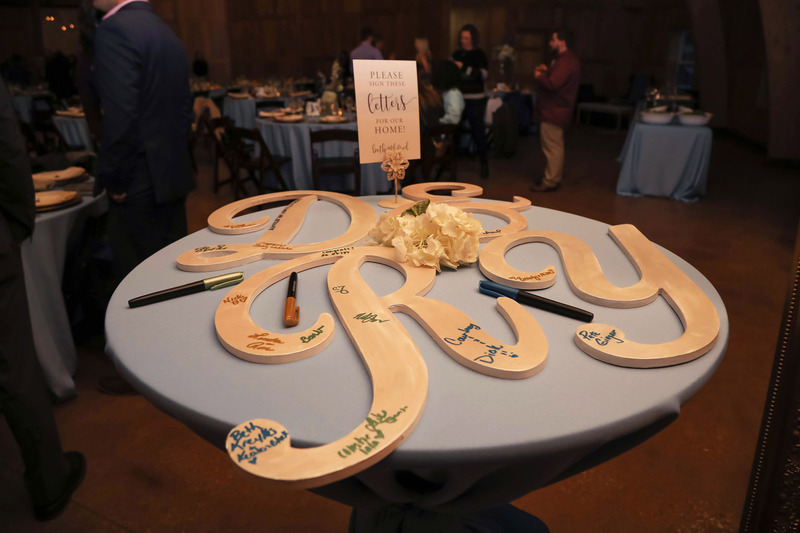 The tables at the reception were to die for. 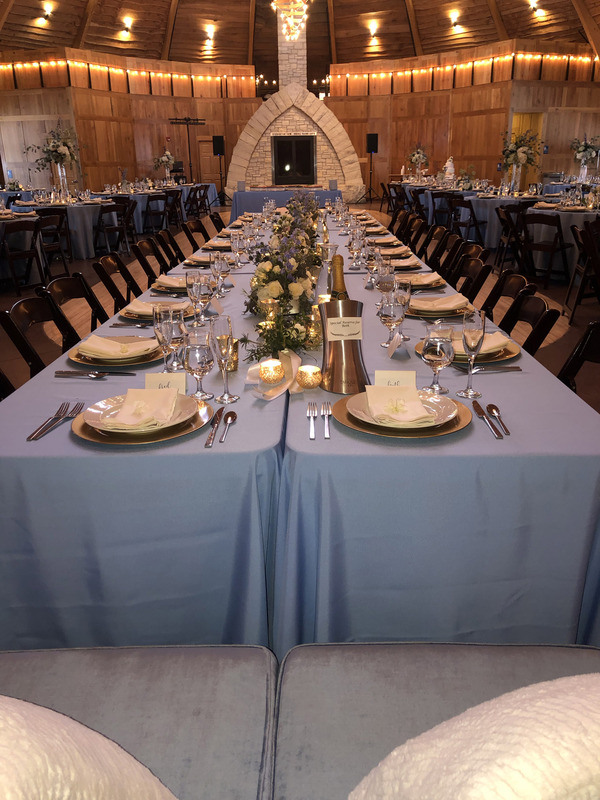 They were set with light blue linens and gold chargers with centerpieces of a variety of shapes and sizes. 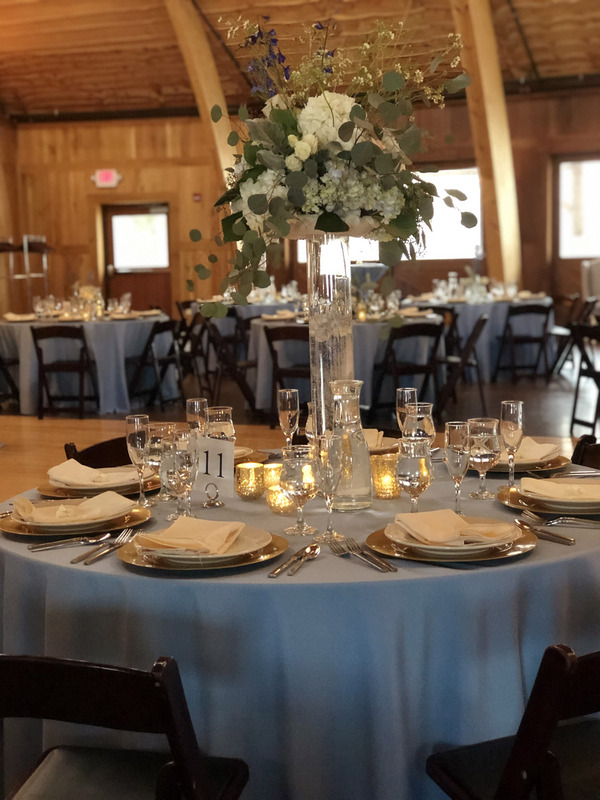 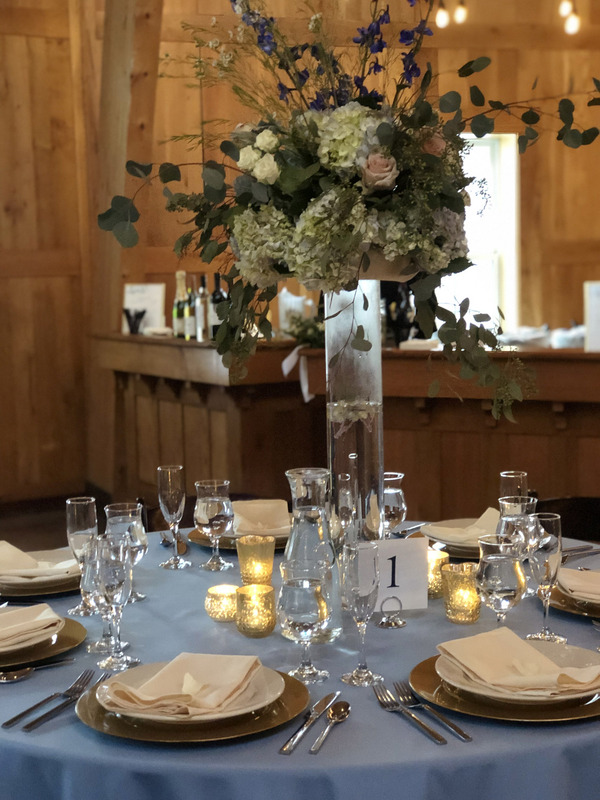 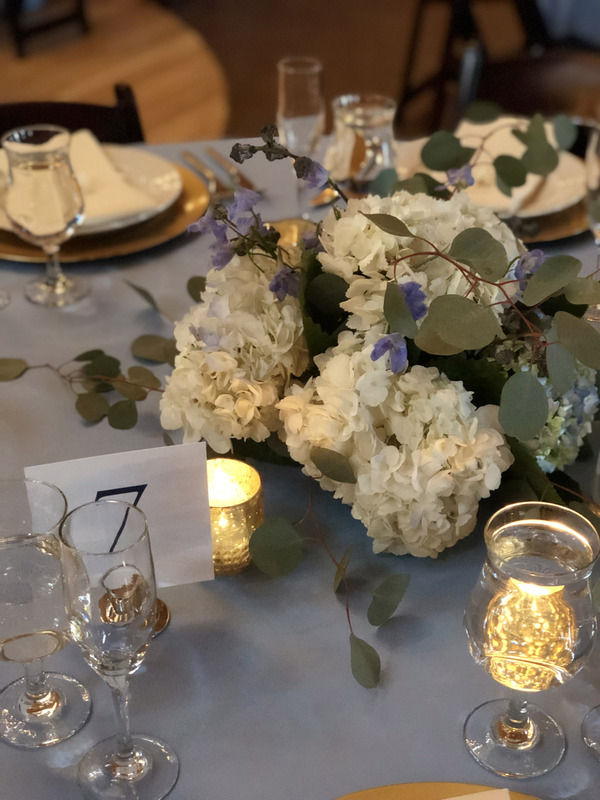 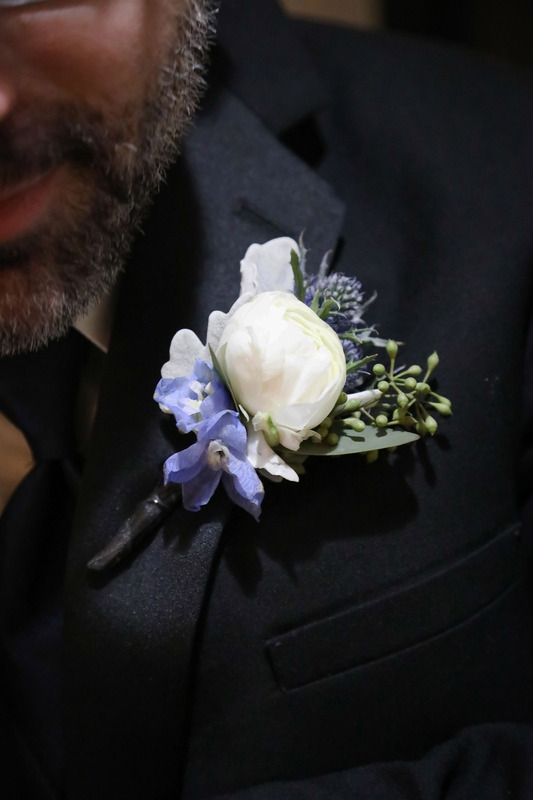 One of the centerpieces was a tall, clear glass cylinder, topped with a full arrangement of greenery, hydrangeas, quicksand roses, and dark blue delphinium. 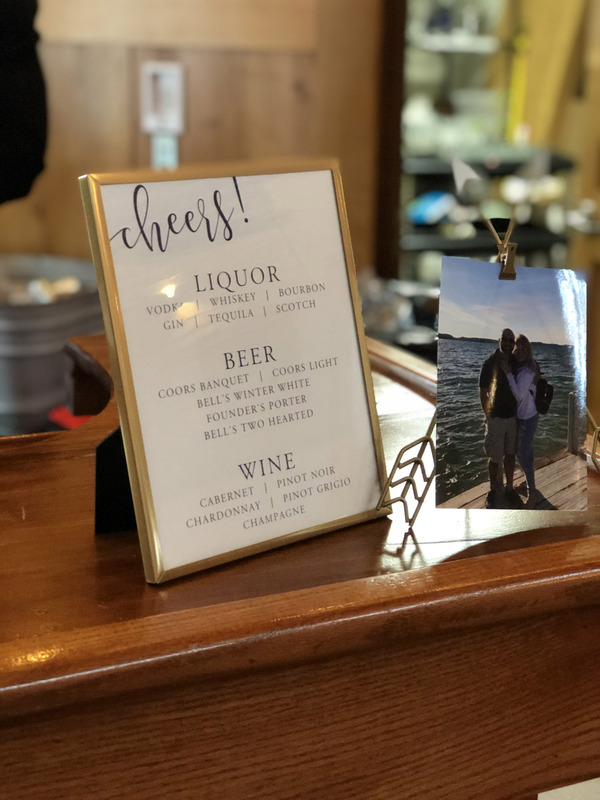 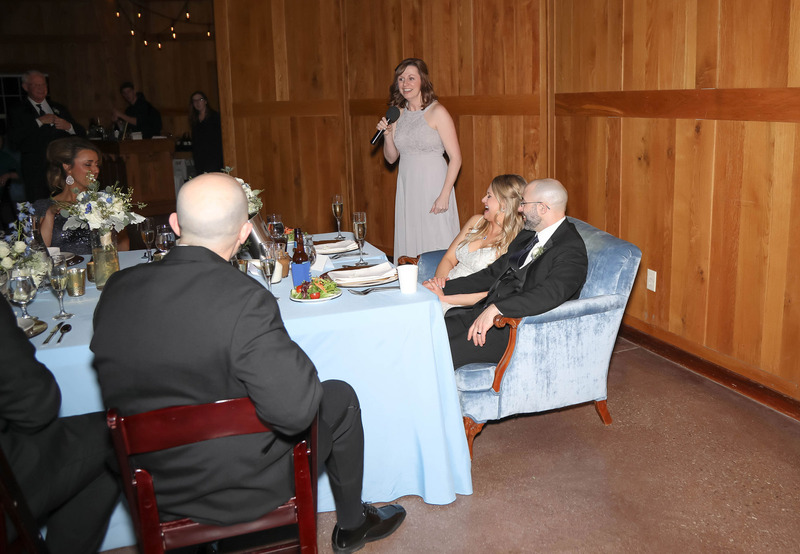 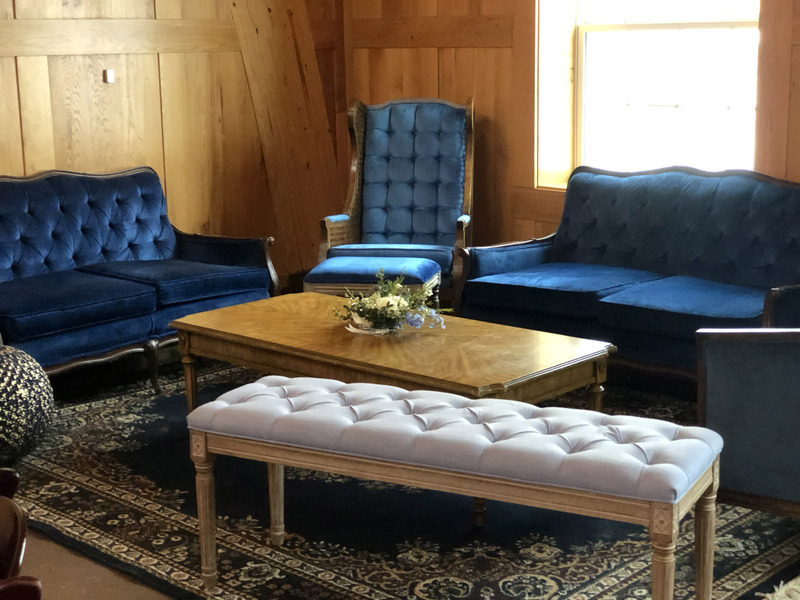 One of our personal favorites of the design plan was the bride and groom’s head table seating, a vintage blue loveseat, as well as, Beth’s special reserved champagne she requested at her seat. 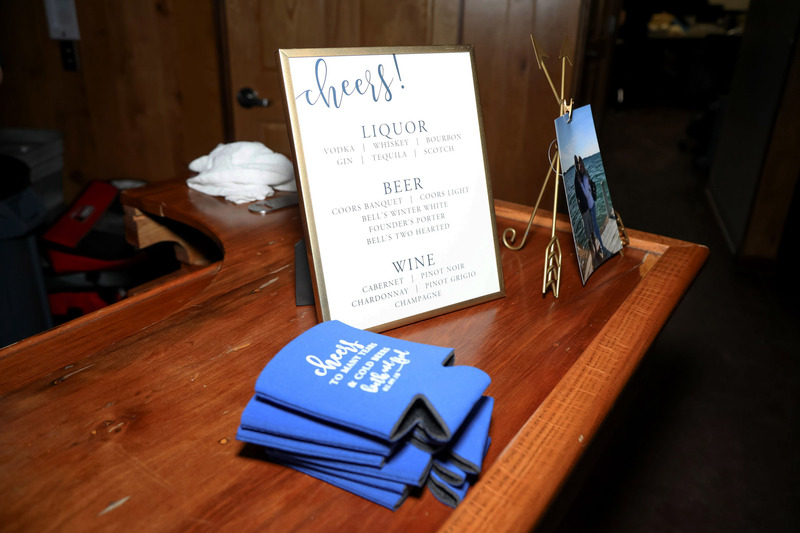 We love when the bride adds her own fun personal touches. 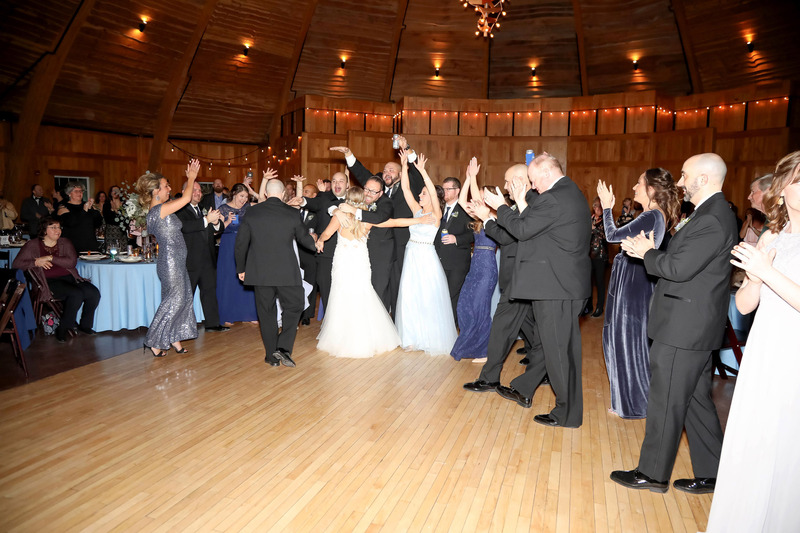 Beth and Fred wanted a large wedding party, which was both alluring and entertaining. 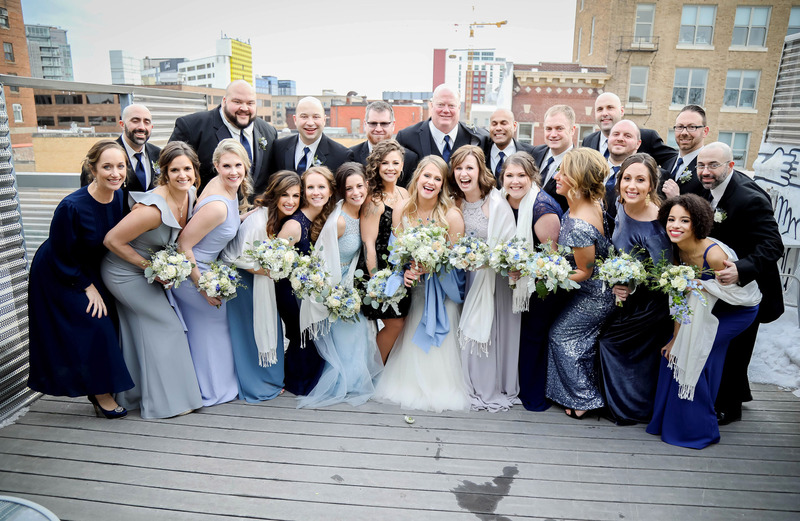 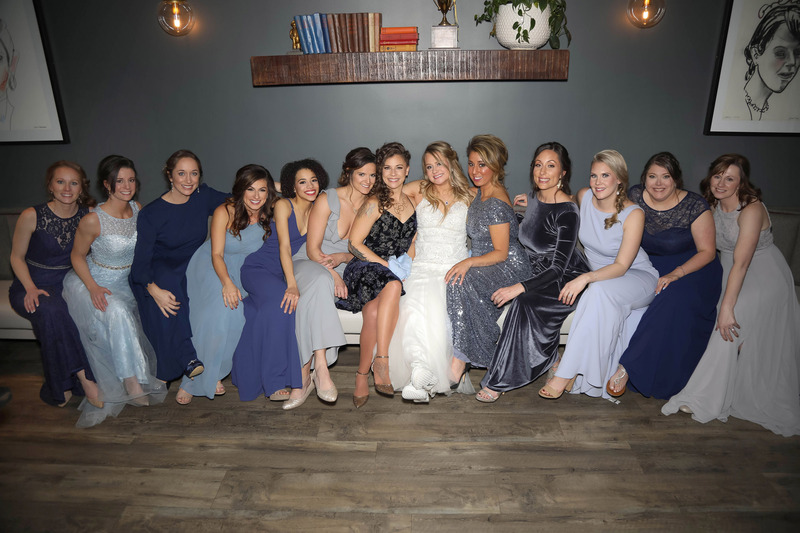 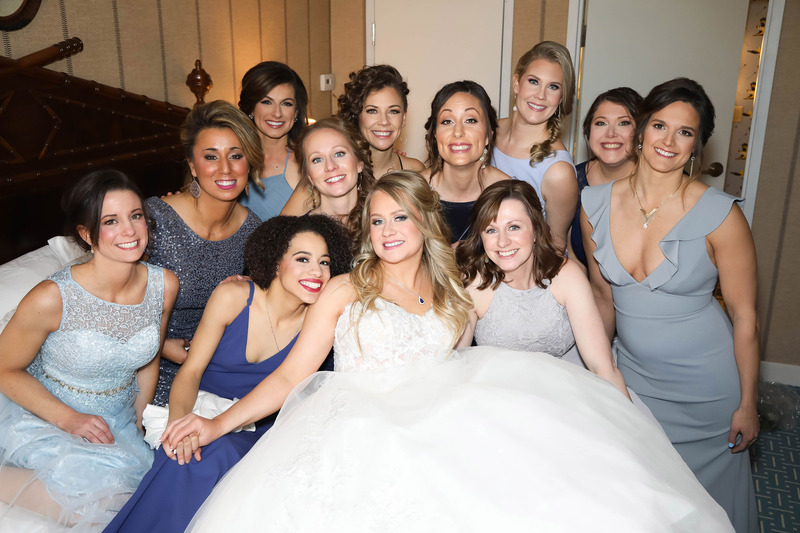 The bridesmaids all wore shades of blue with numerous styles. 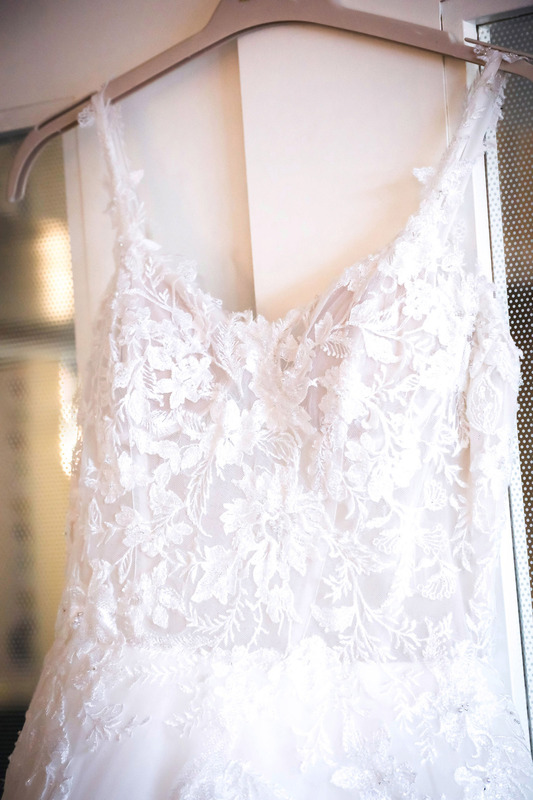 This was a great for the bridesmaids to be able to choose a dress that fit their own style. 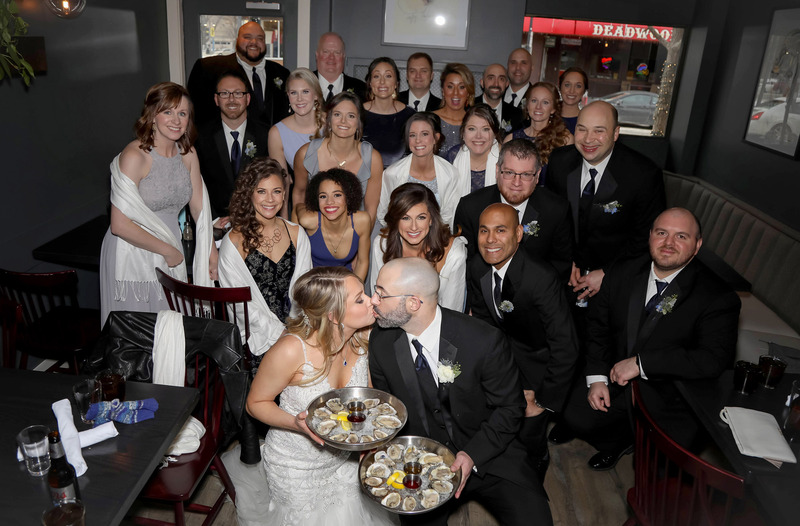 We had a blast getting ready and taking fun photos with this group. 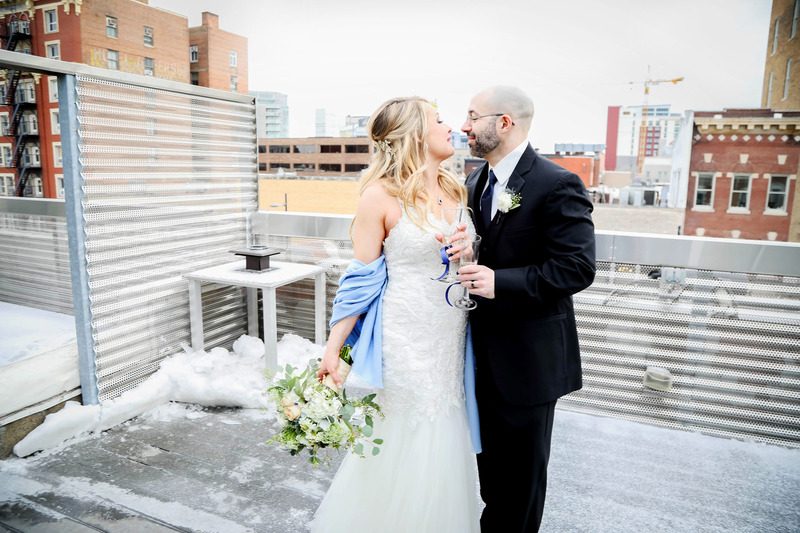 We couldn’t have asked for a better winter wedding day. 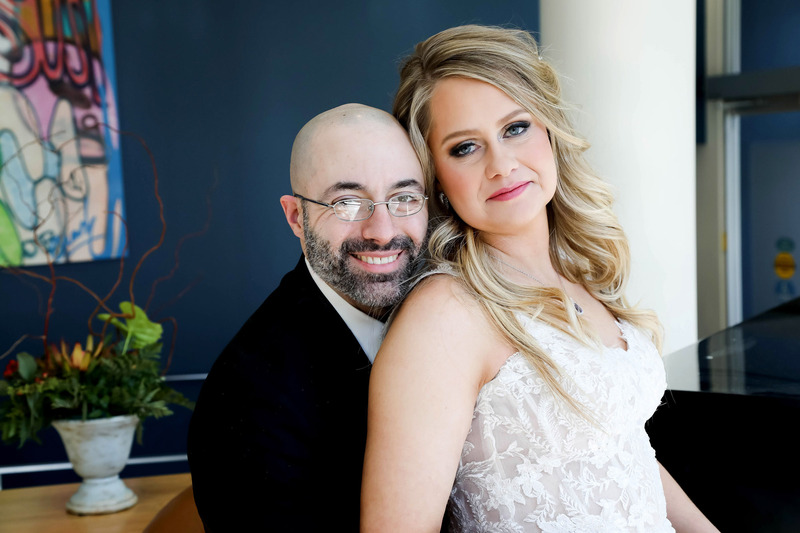 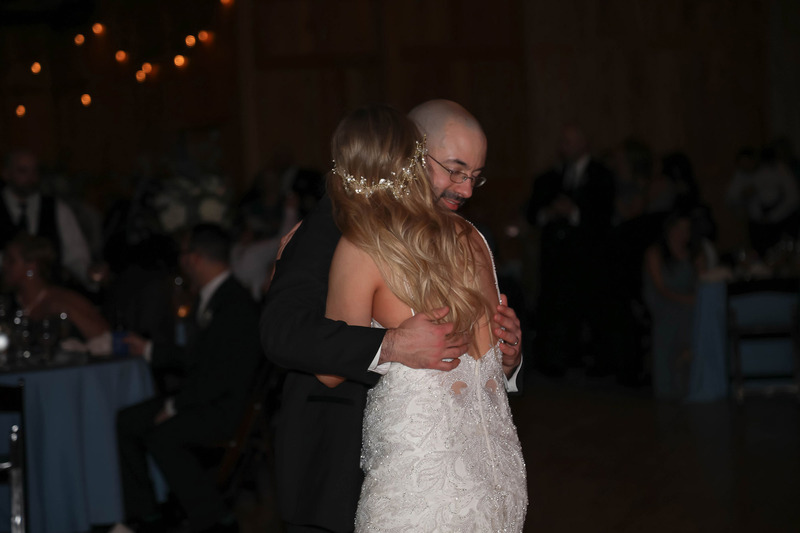 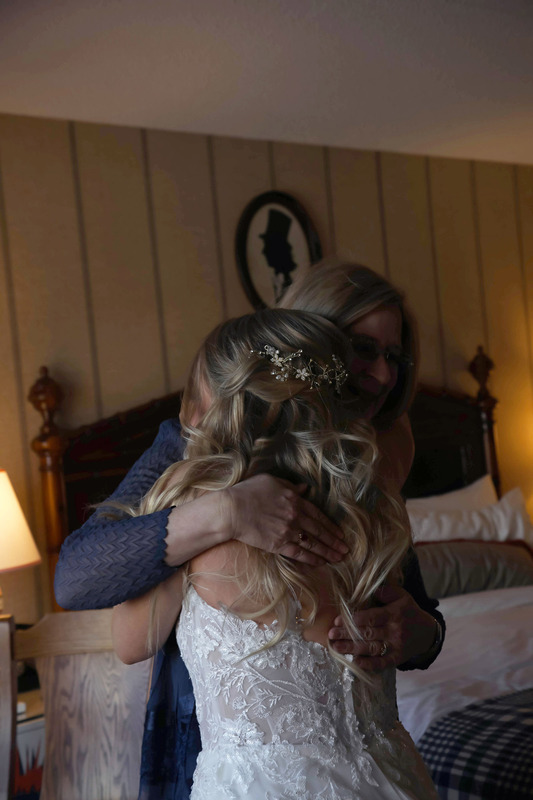 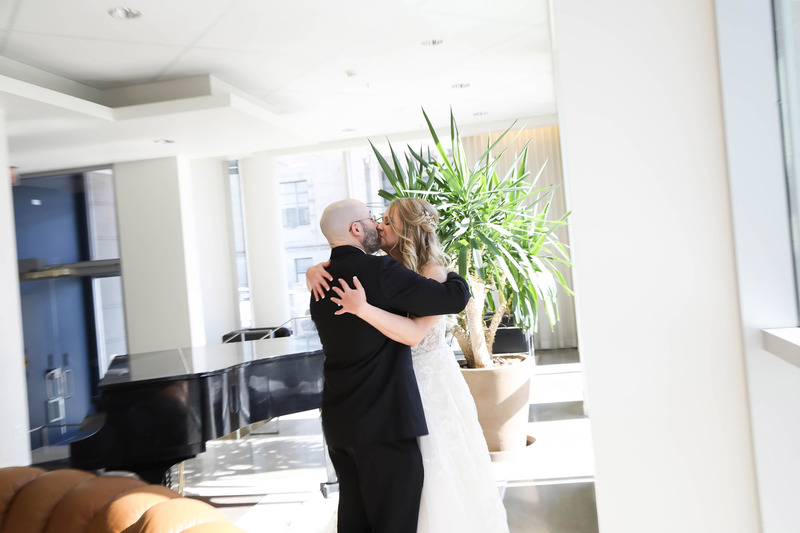 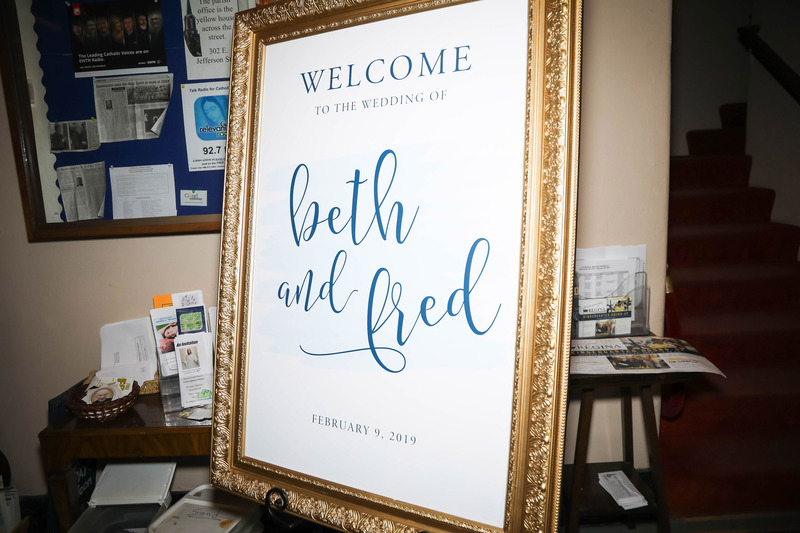 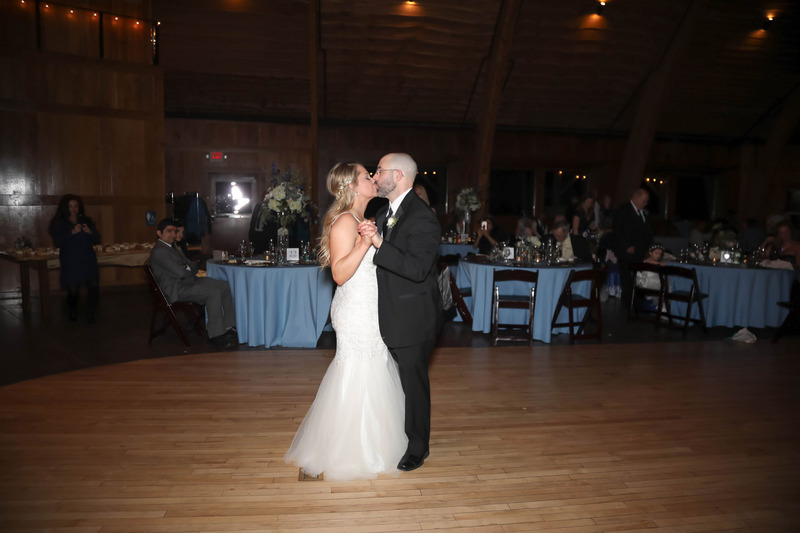 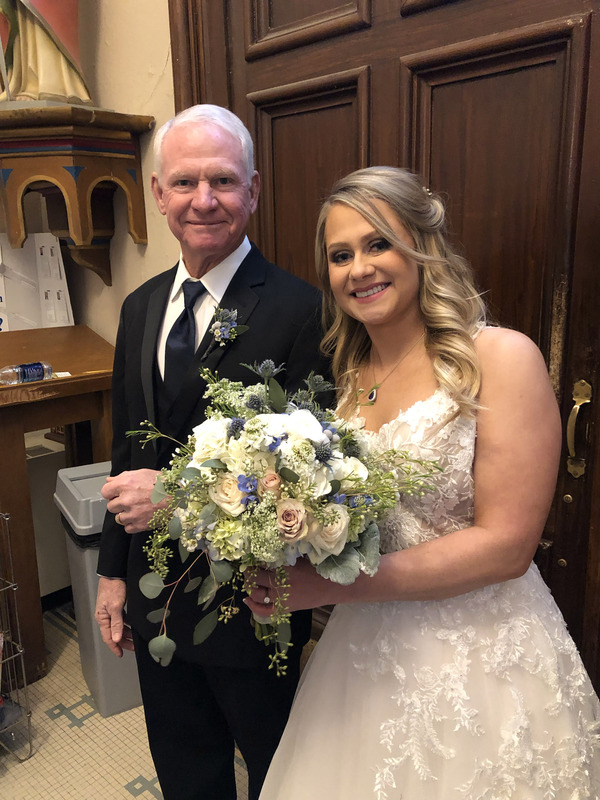 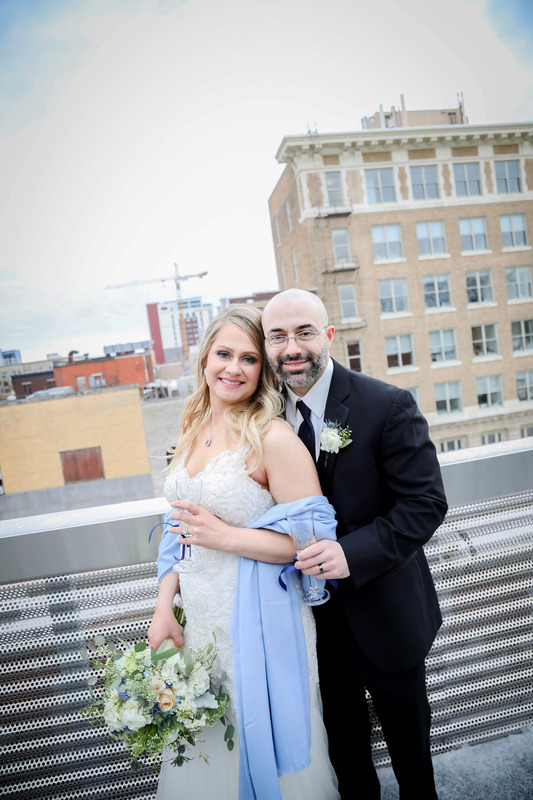 Beth and Fred, we wish you a lifetime of amazing memories like this day!